The songs on this disc, Parfums, from Berlin Classics are all settings of French 19th century poems influenced by Impressionism and Symbolism, Tristan Klingsor, Beaudelaire, Victor Hugo, Verlaine and Leconte de Lisle, sung by soprano Christiane Karg accompanied by the Bamberg Symphony Orchestra, conductor David Afkham. The disc starts conventionally enough with Ravel's Shéhérezade and finishes with Duparc's L'invitation au voyage, La vie anterieure and Phidyle. But in between the items are rather intriguing, with John Adams' orchestration of Debussy, Le livre de Beaudelaire, Britten's Quatre Chansons Francaises written when he was just 14, and one of Charles Koechlin's Trois Melodies, 'Epiphanie'. The first song of Shéhérezade, 'Asie' introduces us to the many virtues which Christiane Karg brings to the disc. She sings with a seductive sense of line, but is not over indulgent. There is clarity and flexibility to her phrasing, and an underlying classicism. Overall there is an immense sympathy for the language, there are real sung poems. And not just luxuriance, there are plenty of impulsive moments and drama. La Flûte enchantée has a languid sense of recitative to the language, with a shapely langour to the phrasing. The lovely solo flute is just one example of the fine clarity and suppleness the orchestra brings to the accompaniment. The final Ravel is languidly seductive, yet with a clear eyed clarity. 'Le balcon' from Le livre de Baudelaire is a big change, with Adams' orchestration giving a richer, more sumptuous feel to the piece. There is complexity to the harmony and vocal line, yet it is performed with ease and we reach moments of nice ecstasy. 'Harmonie du soir' is nicely supple with lovely colouring to the words. The undulating vocal line intertwines seductively with the instruments. There is a real sense of the poetry capturing a moment. 'Le jet d'eau 'is a mesmerising combination of words and music beautifully inflected and surrounded by John Adams' elegant orchestration. The final song, 'Recuellement' (John Adams only orchestrated four of Debussy's five songs) is quietly intense, as if confiding something. And there are some lovely floated top notes too. Britten's Quatre Chansons Francaises are astonishing considering he was only fourteen when he wrote them. It is easy to play spot the influence, not just the inevitable French composers but also Berg and Bridge. The second song, 'Sagesse' is ravishing though the passion is clear and cool (Britten was only fourteen after all). 'L'enfance' has some folk song hints whilst 'Chanson d'automne' seems to be the young Britten trying in the manner of seductive Ravel. 'Epiphanie' comes from Koechlin's Trois Melodies Op.17. There is a nice seductive calm about the piece, with a ravishing, relaxed unfolding melody. Karg's approach to the Duparc is perhaps less luxuriating than some, she sings with poise and a classical clarity with words to the fore yet a supple line. This continues in 'La vie anterieure' which, whilst beautifully controlled, also gets quite dramatic. Finally 'Phidyle' which has a ravishing texture with a lively suspension of time. 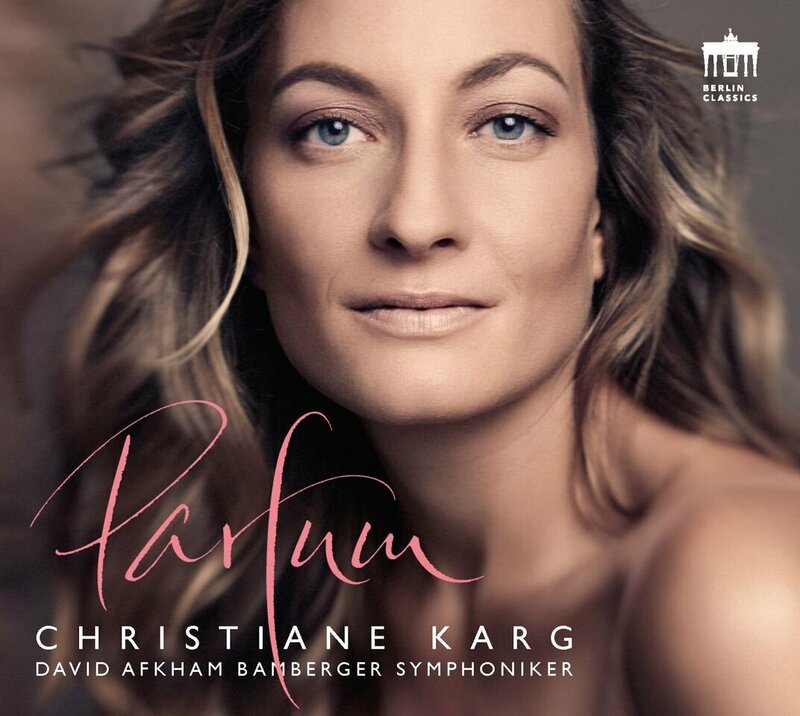 Throughout, Christiane Karg is well supported by David Afkham and the Bamberg Symphony Orchestra, who provide similar virtues of clarity of suppleness of line. This is an enchanting disc, it really does capture a moment and the combination of classicism and seduction is magical. Christiane Karg makes her BBC Proms debut on Monday 21 August 2017, with a recital with pianist Malcolm Martineau at the Cadogan Hall, performing Ravel, Hahn, Koechlin & Poulenc. Details from the BBC website.